In our last blog, we talked about the history of the panic bar. For those just joining us, the panic bar, also know as panic exit device, crash bar, or push bar, was invented by Robert Alexander Briggs in England after the tragic Sutherland fire that claimed the lives of 183 children. After a similar event in Chicago, the Iroquois Theater Fire which killed 600 people, Carl Pinzler enlisted the help of Henry H. DuPont to build a device that would allow doors to be locked from the outside, but still allow for those inside to exit. The first panic bar was available through the Vonnegut Hardware Company, a company formed by Pinzler and DuPont. Ever since then. the panic bar has become a standard safety measure for doors for all public buildings. Today, most doors of public buildings have panic bars, but if your building doesn’t have panic bars and you’re wondering if you should have them installed, here are five benefits for investing in panic bars. As you can guess from the introduction to this post, the benefit most considered when installing doors with panic bars is the increase in safety. No one wants to be responsible for unnecessary loss of life due to patrons being trampled during a panic stampede or simply not being able to get out of a building when there is a fire or other catastrophic event. Panic bars also have non-emergency safety benefits. Increased building security – Doors with panic bars can be locked so that those on the outside cannot enter unless with a key, key card, or access code, while those inside the building, can exit freely. Alarm system capability – Many doors with panic bars are equipped with alarm systems so that if someone takes an unauthorized exit, alarms sound. 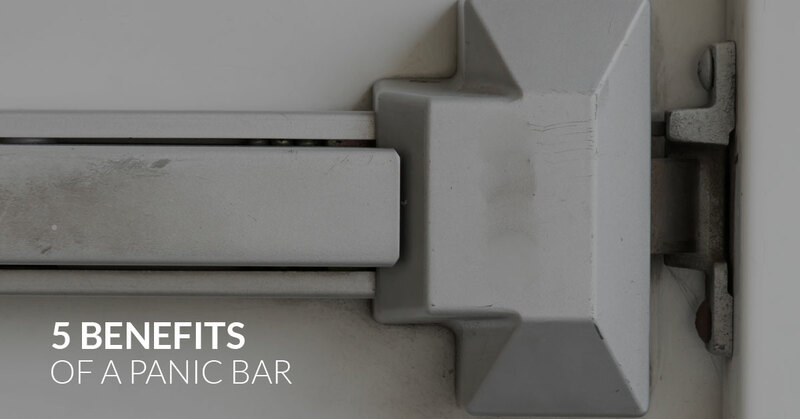 Contemporary Touchbar – This type of panic bar fits with a variety of building styles, is easy to use, and has the capabilities to have other security features, such as alarms and keycard admittance, and more. Traditional Touchbar – This kind also fits in well with the aesthetics of many buildings and is made for heavy use. Economical Touchbar – This is the most basic panic bar that comes in a variety of styles and can also fit in well with the overall look of your architecture. When it comes to panic bars and the doors that have them, there are a lot of options that are sure to serve your purposes. It may feel frustrating if you are a business or building owner and must outfit your doors with panic bars; you must invest in one more “thing.” Fortunately, panic bars are relatively inexpensive themselves, as well as the needed locksmith service charges. Though your local locksmith will be able to give you a more specific idea, you are looking at spending $100-300 per door, and you may, if you have multiple doors, be able to get a discount! What you pay to install your panic bar doors may be made up for in decreased insurance premium costs. In many cases, the more safety precautions that you take, the better insurance premium you will have. Consider installing carbon monoxide detectors, smoke detectors, fire extinguishers, and more. Also, those who live, work, or shop in your building will greatly appreciate your efforts for safety and may frequent your business because of it, giving you opportunity for greater profit. As we’ve talked about previously, there is a reason for panic bars. More recent tragedies may have resulted in greater loss of life if there had not been doors with this safety precaution. In life, there is no guarantee, but when you install panic bars, there is a greater chance for the safety of those in an emergency situation. This is an immeasurable benefit that will hopefully never have to be tested. While taking the necessary safety precautions, you will enjoy the benefit of the increased security features of your panic bar doors. Want to Install Panic Bars? Are you ready to install panic bars in your building in the Spring, The Woodlands, and the surrounding areas? Call Affordable Locksmith of Texas! Our locksmiths can help you decide what kind of security you need for your building that will also meet the needs of your budget. Our locksmiths offer prompt and professional locksmith services. We have over 10 years of experience and can help you with a variety of locksmith needs. Contact us today! We offer new clients 10% off their first service! Contact us for more information! Locked out? Contact us and we will respond within 15 minutes of your call guaranteed.